In his post for this blog over the weekend, my friend and co-blogger Eric Segall discusses how the record in the Masterpiece Cakeshop case before the SCOTUS is unclear in a way that could preclude the Court from deciding the merits. En route to that conclusion, Prof. Segall explains why, in his view, the case could be seen to present a difficult line-drawing task. At one end of a spectrum are non-expressive goods and services: Purveyors of rental chairs and tents as well as limousine drivers can presumably be obligated to offer their services on a non-discriminatory basis without raising any First Amendment issues. At the other end, the government should not (absent a very good reason) be able to compel a wedding singer to perform a particular song or a poet to recite a particular poem, nor (as Prof. Segall says in answer to a query in the comments), should the government be able to compel the composition of a song or writing of a poem (absent a very good reason). Somewhere in between these end points is the baking of cakes and the taking of photographs. Prof. Segall brackets the question whether enforcement of an antidiscrimination law counts as a very good reason (or, in technical terms, satisfies strict scrutiny), as shall I for the moment. Here I want to problematize but then perhaps resuscitate his suggestion that there exist any goods or services that are not expressive. I shall do so in celebration of the 100th anniversary of Marcel Duchamp's "Fountain," which, in 2004, was voted the most influential work of modern art. Fountain is a "ready-made" upside-down urinal. Duchamp did not sculpt it or otherwise make it. He bought a urinal, turned it upside down, wrote some letters and numerals on it, and called it Fountain. Is it art? A hundred years ago, when Fountain was rejected from an exhibit, that question was open, but having spawned an entire movement of conceptual art (think Andy Warhol, Damien Hirst, etc. ), the question can no longer be considered open--at least so far as the First Amendment is concerned. If free speech includes art, as it does, then surely it violates the First Amendment to deny protection to what a great many artists regard as not only art but enormously influential art on the ground that judges take a controversial view of what counts as art--especially when the message of the work is precisely a message about art. One can think Fountain is bad art or juvenile art; one can even think that it doesn't belong in certain kinds of art museums. But to say--as a matter of the First Amendment--that Fountain is not art is, in light of the meaning of Fountain, to censor art. 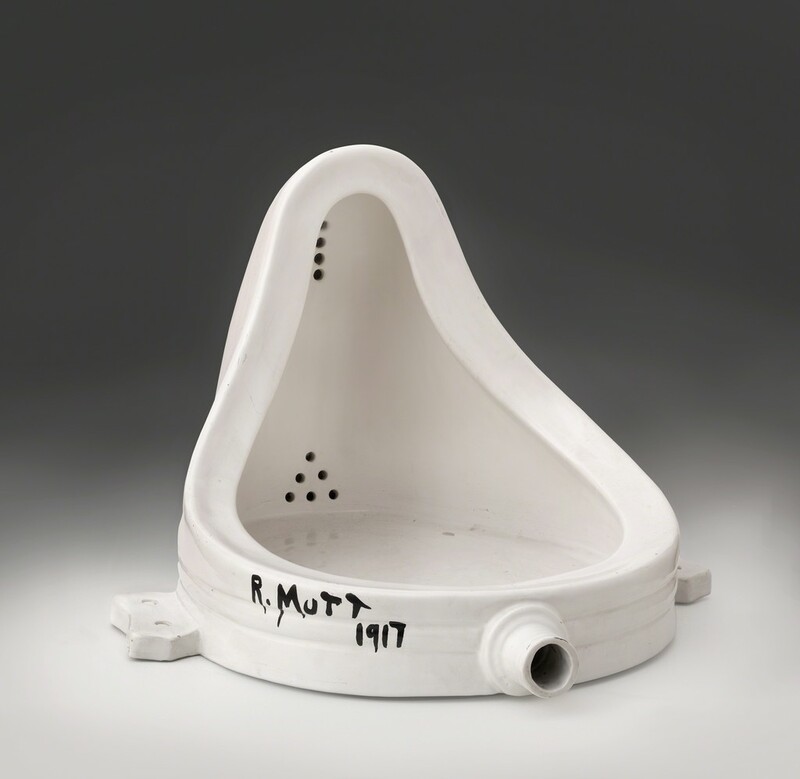 So if a urinal can be art, why can't a cake, or for that matter, a chair, a tent, a urinal cake, or a ride in a limousine (as a kind of performance art)? The short answer, per Duchamp and the conceptual artists who followed in his wake, is that any thing or action can indeed be art--if it is intended as art and/or perceived as art. But this notion of art as encompassing anything that holds itself out as art won't do as a First Amendment standard--at least not if one assumes that whenever a law or policy applies to limit what someone claims to be his or her artistic expression, that someone has a good prima facie defense against the law. If it did, that would be the end of not just anti-discrimination law but just about all law. Suppose that the government regulates the design of urinals for safety reasons. Perhaps it imposes limits that aim to prevent splashing. A purveyor of urinals that violate the government regulations can now assert an expressive interest in designing splashy urinals. Or if that example is too silly for you, think about much more serious health and safety regulations of workplaces. The employer who wants to violate the Fair Labor Standards Act or the Occupational Safety and Health Act can claim that his employees are part of a work of performance art, as can the motorist who wishes to drive faster than the speed limit. It won't do to say that in many, perhaps most, of these cases, the government will prevail because its interest in health, safety, combating stigmatic harm, or whatever is sufficiently strong to overcome the asserted free speech right. It won't always prevail, and even the subjecting of regulations to heightened judicial scrutiny would hamstring effective government. Nor will sincerity work as an effective screen. Unlike religion, where, despite hard cases at the margin, courts have had little difficulty distinguishing genuine religious beliefs from self-serving insincere ones, expression is self-defining. It may well be that the person who wishes to express the message that driving fast is cool by driving fast only developed that expressive intent upon realizing that he needs it to evade traffic tickets, but once he develops the expressive intent--even if self-servingly--he expresses that message through his driving. To my mind, there are really only two ways around this problem. One, which I favor, is simply to reject the idea that free speech is implicated in any of these cases, except incidentally. Ordinarily, free speech law distinguishes among: (1) content-based regulation of speech (subject to strict scrutiny); (2) content-neutral regulation of speech (subject to the O'Brien/time-place-manner test, which is something on the order of intermediate scrutiny); and (3) regulation of conduct that happens to be expressive in a particular application, as when a police officer gives a ticket to a newscaster speeding to the studio to deliver the evening news, as in a hypothetical example provided by Justice O'Connor in the Arcara case (subject to no special free speech scrutiny at all). Anti-discrimination regulation is regulation of conduct. I can understand that some finely articulated sub-specialties of anti-discrimination regulation (such as hostile-work-environment sexual harassment law) could trigger O'Brien scrutiny, but that's at the outer limit. And yet, as I have lamented in the past (here and here), the Supreme Court in the Hurley case and the Humanitarian Law Project case has sometimes treated the application of a conduct-targeting law as content-based because it happened to apply to expressive activity in a particular case. Ideally, the Court would reject that approach. Failing a stricter understanding of what makes a law or its application content-based, it may be necessary to distinguish among types of conduct based on something like their on-average expressive content. Wedding poets for hire would have a prima facie defense against anti-discrimination law if they refused to write pro-SSM poems but limo drivers would not, even though we can imagine a particularly expressive limo driver who would thus end up being compelled, via his driving, to express views with which he disagrees. If one goes down this route one would need to keep the category of on-average expressive conduct tightly confined, because, as noted above, in a post-Duchamp world, speech-based exceptions threaten not only anti-discrimination law but potentially all laws. Heretofore, no one has thought that the application of the antitrust or labor laws to newspapers, much less bakers, raises any free speech issues, but it is easy to imagine a bonanza of such claims should Masterpiece prevail in the SCOTUS. The Lochner Court protected bakers from labor laws under the rubric of freedom of contract; it did not work out well. There is reason to believe that protecting bakers from labor laws or anti-discrimination laws under the rubric of freedom of speech would not go well either. When credit card transactions become subject to free speech disputes, as one did last term, I also don't think there is an easily cabined "expressive" content test though tbh I understand it up to a point. But, even there the wedding part is as much "expressive" in some ways as the cake itself. When this was up for discussion a few years back, e.g., at Volokh Conpiracy, I could think of any number of possible professions with some "expressive" content and do so quite seriously. Photography is very expressive but "no" law covers lesser expression too. Cabinet makers can be very artistic etc. As to Lochner, a basic "liberty to contract" is to me granted in our system, but one that is legitimately regulated in various ways. The problem to me in that case was spelled out in Harlan's dissent -- the reasonableness of the legislation deserved it to be upheld. As you say, the anti-discrimination laws here are reasonable too. Let me travel back once again to my early youth (1930s) in the Boston area when as Easter approached the local bakery featured "hot cross buns." Assuming this bakery product could be considered as a "work of art," in this day and age could the baker refuse to sell "hot cross buns" to non-Christians or the LGBT community on either religious or speech grounds? gather "religious grounds" doesn't require "art"
For the case of Masterpiece Bakery, a fairly simplistic definition of expressive content, in the specific context of discrimination law, seems to be sufficient. If the provider would be willing to provide the exact same item, were it not for the buyer's being in a protected class, then there is insufficient expressive content to warrant discrimination. Put another way, if a generic buyer outside the protected class would be sold an item, then the seller must sell that exact same item to members of the protected class. I use "generic buyer" here only to allow items that would be sold under special circumstances to not have to be sold to all buyers. However, if this was being abused I would be willing to simplify it to "any buyer outside the protected class." This rule alone should be enough to dispense with Masterpiece Bakery, given the extremely poor quality of the record in that case. It doesn't really do anything to help with a true speech case like Elaine Photography. However, the rules above do have an interesting effect, in imposing the rule that the meaning of a piece of art would be legally fixed in the content of that art, and not in its context. Art students will rightly object to this classification, but legally I am okay with it. In effect, the law would be saying that if a baker is okay with making a rainbow sheet cake for a birthday party but not for a wedding, they must be willing to sell couples getting married rainbow birthday cakes, despite knowing (or at least suspecting) that the cake will actually be used for a different purpose. Buyer: "We would like to buy a rainbow wedding cake." Seller: "I'm sorry, I can't make that for religious reasons. Would you like to look at our selection of rainbow birthday cakes?" Query: To what extent are farms public accommodations? To the extent they accommodate the public.